Hi everyone. Today is the latest challenge from Addicted to CAS. 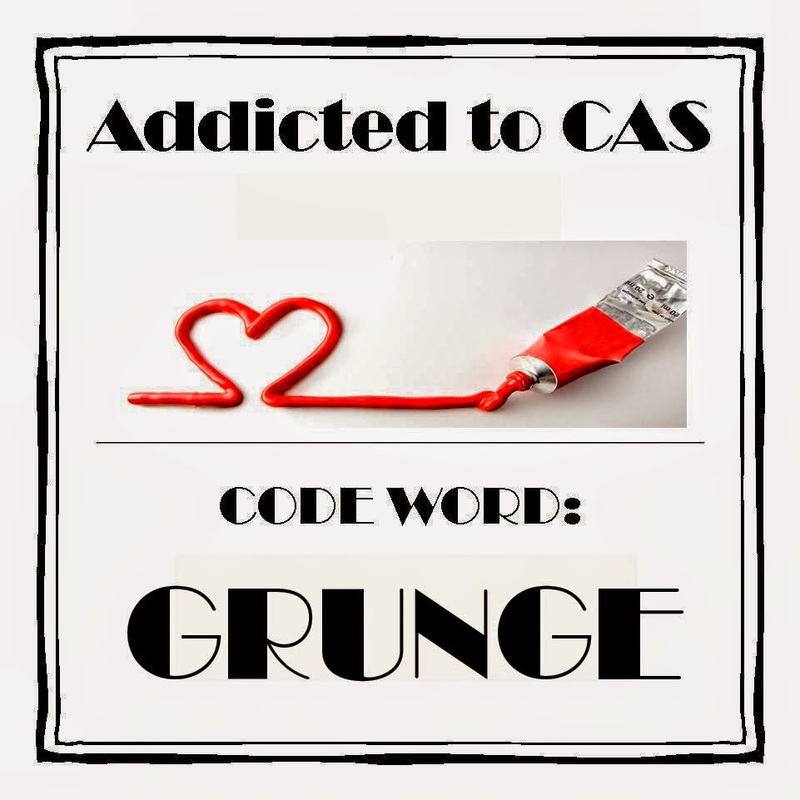 The code word this time is chosen by our wonderful and talented leader, Kylie of Kylie is Addicted to CAS (and now butterflies). Grunge is not a style that I use, but I did have a lot of fun making this card. I randomly sponged three colors over the background stencil. I poured water into the palm of my hand, and then dipped my fingers from my other hand into the water and flicked it over my front panel. Because the sponging is such light colors, the splattering doesn't really show in the photo, but it's there. Once dry, I used my scissors to rough up the edges for a distressed look. I die-cut the tattered leaf from white cardstock and roughed up the edges same as the front panel. I dropped some re-inker from each of the three colors onto my craft sheet, misted with water and then dropped the leaf into the diluted inks. Once dry, I added more sponging around the edges to give the leaf more color. A simple sentiment finishes the card. Love your distressed leaf and softly stencilled background - great combination of CAS and grunge! I love your sponged stencil and your leaf is so cool! I love the colors you used. I can definitely see the grunge! Gorgeous - love the colour scheme. For someone who doesn't do grunge, you did a great job! Love the colours you used on the stencil! I am here again - just wanted to let you know how much I love your style! OMG...You even do Grunge beautifully Loll. 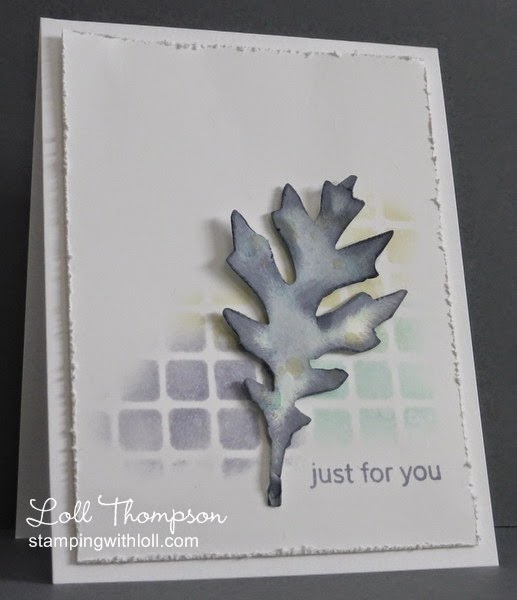 I LOVE your tattered leaf, stenciled BG , distressing and especially the colors you choose. I am SO inspired to make a grunge card because of you my friend. I can't wait to see all the samples from your talented ATCAS team too. Who said you couldn't do grunge???? They fibbed! Fab card Loll. Well Loll, although it's not your normal style, you certainly know how to grunge it up! Great card and love the stencilling and leaf. Very clean and simple for a grunge! You've done a wonderful job on this "grunge" challenge! I had a card made for the last ATCAS challenge and just didn't get it in. Seems like the days just fly by. I'm not sure about grunge, but maybe I can get something in time for this one. This is really gorgeous, Loll! I love the softness of your background and your leaf is amazing! Such a fun combo of CAS and Grunge! Thanks so much for your inspiration! Your torn leaf is really a focal point, and I like the softness of the shade you used. Beautiful, Loll. Love that awesome leaf and the soft colours as the bg. Must admit Loll - grunge isn't my favourite style either, but you definitely created a fab. grunge card here! The leaf is awesome! Hi Loll, loving your take on grunge and the gorgeous subdued colors its wonderful to see everyones interpretation this is spectacular the tattered leaf looks positively marvelous in this environment great stenciling too. You do grunge in the most elegant way, my friend! Love the soft tones and that fabulous leaf! Loll you amaze me - you make any technique or style look easy!! I love the unique color combination you used here and the leaf is perfect! Loll, I love the subtle colors. I also love the masked area and the popped leaf is stunning. Gorgeous!